My surfboard sculpture came out of my desire to create unusual sculptures designed with recycled fused, blown and stained glass on a recycled surfboard. As a professional glass artist and sculptress, I wanted to reuse some of the glass items that were sitting around my studio. I found the delicate contour of surfboards to be a perfect form to compliment the flow of glass. There certainly is no shortage of boards in our coastal town and I figure this was a way to give an old board new life. My first board was reincarnated from a thrift store find. I infused a “Glass Kelp” design into the board with a mixture of colorful recycled glass elements. After my first mosaic surfboard success, I was hooked on the concept. I loved everything about giving boards a new purpose using my passion for glass. I set out to find more surfboards that were past their prime. As I continued with the designs, I realized my passion for reviving old boards was partially due to my love of the water and water sports. As a waterskier, boater, kayaker, beginner surfer and paddle boarder, water sports have been part of my history and my lifestyle. I have an innate appreciation for the sea. My love for being on the water calls to me often. My favorite sport as a young adult was waterskiing on the Puget Sound and now I enjoy kayaking Lake Hodges and paddling in the ocean. Traveling and enjoying the ocean is my passion. 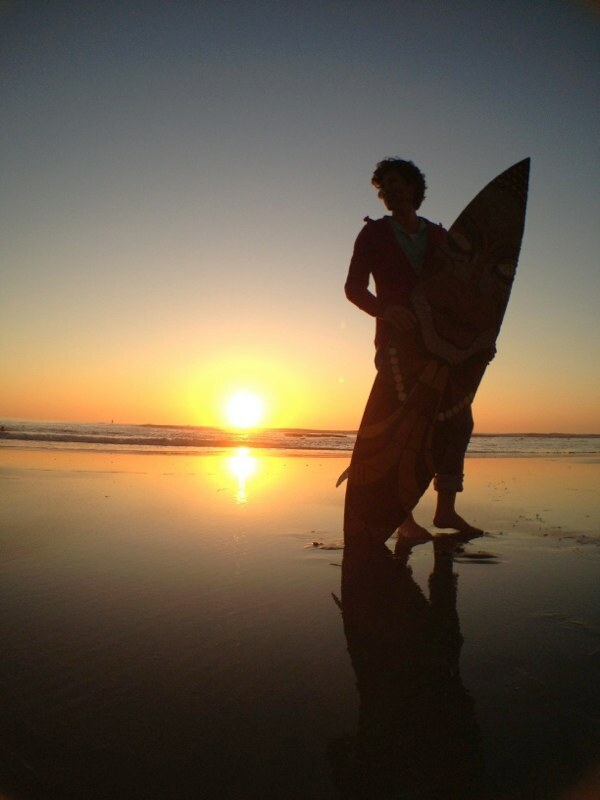 The boards that I work with have an energy obtained through their experiences with their surf riders. I like knowing that someone had a really good time on their board. I want to immortalize that passion with a new life as a glass sculpture. Once the integrity of the board gets to a certain point of no return, boards are often lovingly retired to a corner of a garage as a private “shrine to great times”. I found it disheartening to find so many boards are abandoned yet still loved. I wanted to find a way to immortalize the memories surfers share with their favorite boards. I found my passion in giving these old foam and fiberglass veterans of the sea a new life as ‘Glass Sculptures to Great Times’. Maybe you have an old board that you would like to reincarnate into art for your home or garden. You can keep your surf memories alive for all times. Contact me and we can discuss options.